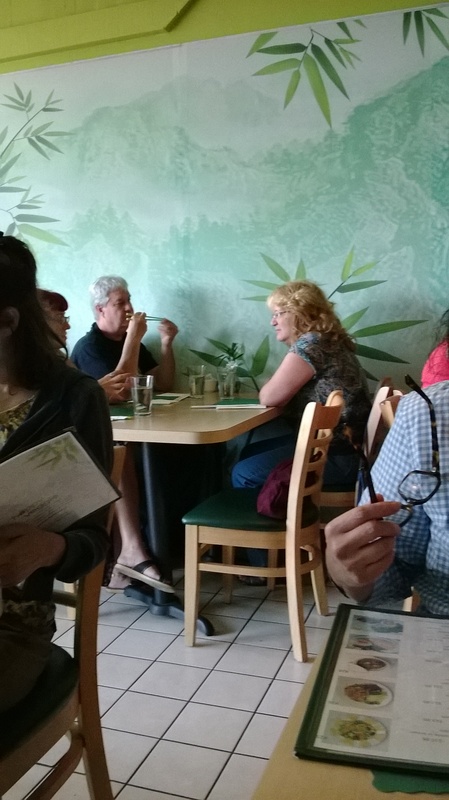 A friend and neighbor suggested a vegetarian restaurant in Redondo Beach for dinner. While I am not a vegetarian, I do prefer eating vegetables over meat. The reviews online seemed to be quite decent, so we decided to give it a try. 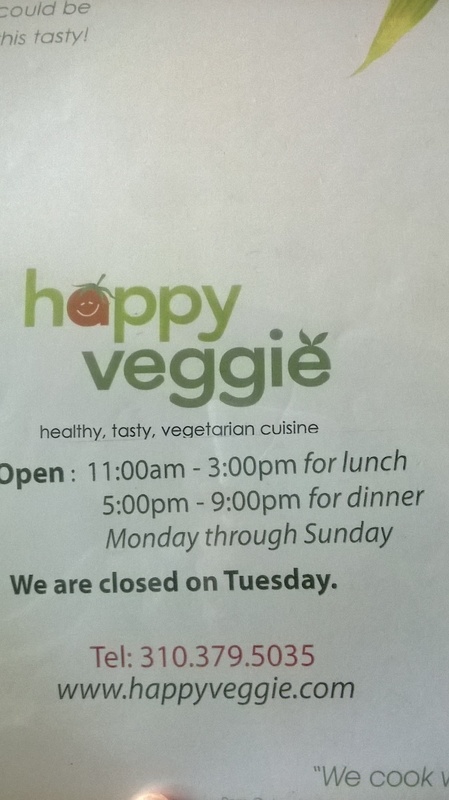 I was looking at a deal for a Peruvian restaurant from an email, and noticed that there was a 40% discount for Happy Veggie, the same restaurant that we were about to go to that evening. “Great!” I thought to myself, so I purchased the coupon for $18 which was good for $30 for dinner. 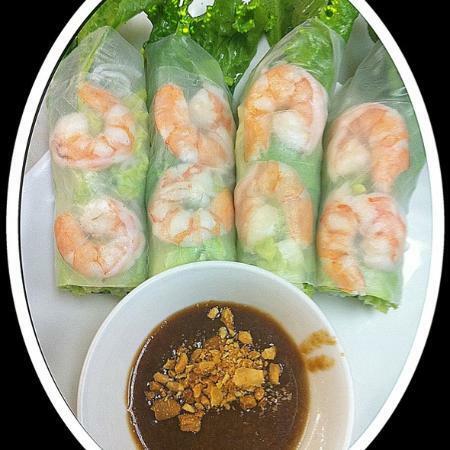 The restaurant is situated in a nondescript strip mall near the Redondo Pier. The inside of the restaurant was on the small side, and the place was almost full this Saturday evening. Being that I do not enjoy eating imitation meat, we opted more for the vegetables dishes. We ordered the Curry Vegetable Masala, the Pho, the Eggplant Tofu, and brown rice. My favorite was the Curry Vegetables, probably due to the more complex flavors of the curry sauce. 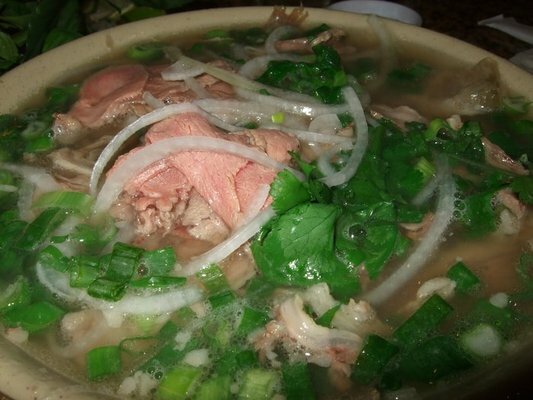 The Pho was large with a good variety of fresh vegetables – it was really tasty even though there was no meat. My friend preferred the Eggplant Tofu. 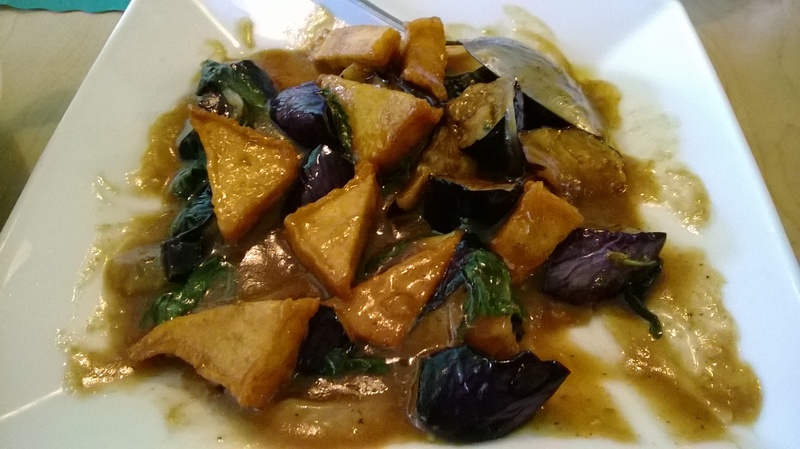 The eggplant was cooked perfectly, soft but not mushy, and the fried tofu had a soft center with a chewy outer skin. The waiter was efficient and helpful, and genuinely friendly. I can see myself coming back for a light lunch in the not so distant future.